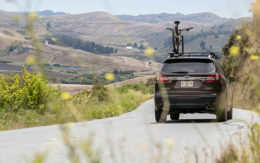 The 2019 Nissan Rogue, an older subcompact crossover, was a surprise hit on an adventure drive that started with surfing in the Southern California waves and ended on the slopes of the local mountains in the same day. The Rogue, last redesigned in 2014, proved why it was the fifth-best-selling vehicle in the U.S. last year. Trucks.com and a group of avid surfing and winter sports enthusiasts tested the Rogue, a 2019 Honda CR-V and a 2019 Toyota RAV4 Adventure on the drive. The goal was to see how the crossovers handled the diverse driving and gear-hauling conditions. They are the three best-selling vehicles in the U.S. after the big pickup trucks from the Detroit automakers. The design of the Rogue is the embodiment of jellybean crossover styling. It does little to stand out from competitors and blends in with traffic. It has a starting price of $24,920. The vehicle Trucks.com tested came equipped with the SL trim, all-wheel-drive and several packages that brought its price to $36,085 including the $995 destination charge. The Rogue provided a smooth and comfortable ride with confident handling. Its engine offered good acceleration whether on the highway or climbing a mountain. The Rogue stood out for its overall performance without excelling in any particular area. Drivers could feel the road through the electronic steering, yet it did not deliver thrills on twisty roads. Sport mode held onto gears longer, but the Rogue suffered from relatively low power and a smooth but sluggish continuously variable transmission. The Rogue’s best features are its comfort and efficiency. The Rogue SL tested by Trucks.com came with standard 19-inch wheels, leather-appointed seats and advanced safety equipment. It sported Nissan’s optional all-wheel-drive system. Power came from a 2.5-liter four-cylinder engine with 170 horsepower and 175 pound-feet of torque – the weakest in the group. The Rogue is not an out-of-the-box adventure vehicle. Its gentle suspension and economical tires are more attuned for school drop-offs and highway cruising. A tow hitch receiver is available as an optional $315 accessory. However, the all-wheel-drive system worked well on packed snow, and the SL trim comes with raised roof rails, which are preferred by adventurers because they allow easier installation and removal when regularly changing equipment on their vehicles. The handsome cabin, upgraded with the $250 Platinum Reserve package, also earned high marks. But Soulopulos noted a flaw with the perforated seat upholstery. “These little holes are great for getting sand stuck in them,” he said. Otherwise the Rogue works surprisingly well for fun trips to the outdoors. To transport the two surfboards loaned to the group by Infinity Surf from Dana Point, Calif., the team mounted an Inno INA445 carrier to the Rogue’s roof rails. The carrier held the boards firmly in place after several hours of high-speed turns that tested the rack’s stability. At the end of the day the Inno rack required only a couple of clicks on its tensioner to reset the tension on the boards. But mounting the surfboards on top of the Rogue rendered its rear hatch unusable. 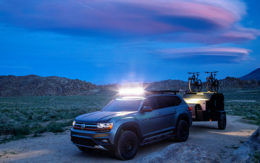 Instead, drivers had to load their luggage and skiing equipment into the rear cargo space by folding down the second row of seats and tossing their gear inside. The Rogue provided plenty of space with 39.3 cubic feet behind the second-row seats, slightly more than the Honda and 2 cubic feet more than the Toyota. The crew found access to the rear suitable, although the Rogue’s seats do not fold as flat as those in the Honda. Inside the cabin, the standard 7-inch color display is well-sized for the class and provides clear graphics. The menu is easily navigable, with smart choices that use the touch screen for some settings and traditional buttons and knobs for others. The system is easy to use and comes with Apple CarPlay and Android Auto compatibility. Nissan includes its ProPilot Assist suite of advanced safety features on the Rogue SL trim. Its technologies include adaptive cruise control, lane-keep assist and automatic emergency braking. Trucks.com’s team found it the easiest automated system of the three vehicles and applauded Nissan for its intelligent safety. ProPilot Assist is easy to activate and works well to minimize the risk of a collision in many situations. There were some critiques. The lane-keeping assist system sometimes kicked in as drivers turned within their lane on the highway, bumping the Rogue toward vehicles in the outer lane rather than following the curve of the road – a slightly unnerving experience. The system warns drivers who are not touching the wheel to pay attention with ever-increasing beeps, which if not followed abruptly activates braking to shake the driver awake. The warning is understandable, team members concluded. However, the brake check could pose a safety hazard to other vehicles. Another issue is the lane-departure alert, which beeps whenever the Rogue veers too close to its lane markings. This is not a problem on highways. But on mountain roads it is irritating. “The beeping gets annoying real fast,” said Caley Vanular, a snowboarder from Vancouver, Canada. Still, Vanular said, ProPilot Assist improved her impression of the Rogue. “Otherwise the safety equipment works really well,” she said. A plus was the Rogue’s backup camera, which afforded a 360-degree view around the car for managing tight quarters while parking. It was the only one of the crossovers with this. The Rogue SL AWD has an Environmental Protection Agency rating of 25 mpg in city driving, 32 mpg on the highway and 27 mpg overall. Its rating is comparable to the rest of the group, though the RAV4 and CR-V have slightly better numbers. The Toyota has a rating of 24 mpg city, 33 mpg highway and 28 mpg overall. The Honda scores 27 mpg city, 33 mpg highway and 29 mpg overall. The 2019 Nissan Rogue is not a go-anywhere explorer. But its capable available features, functional technology and attention to value make it a good option for daily commuters and weekend warriors. When it comes to seasonal activities like surfing and skiing, the 2019 Rogue proves that crossovers have their versatile reputation for a reason.